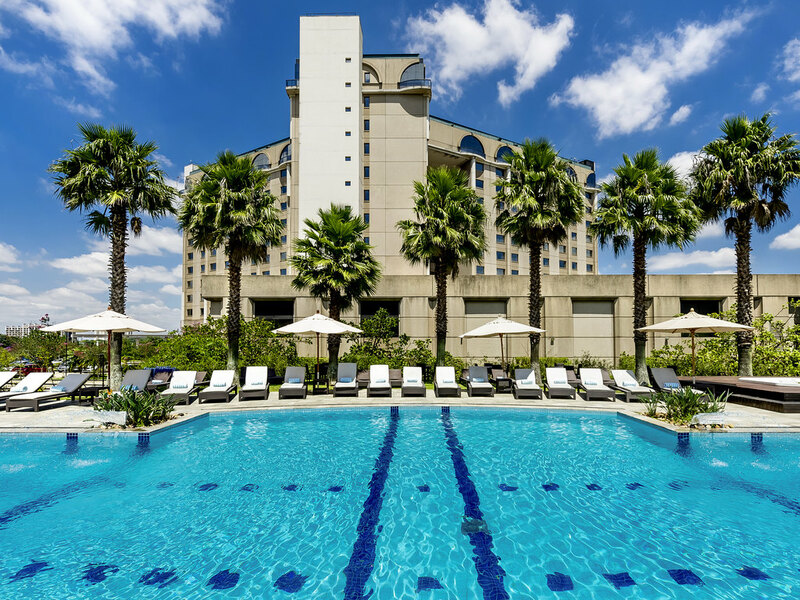 The Pullman São Paulo Guarulhos Airport hotel is located near Guarulhos International Airport. It brings together style and sophistication in spacious, comfortable rooms and suites with air conditioning and WIFI. The hotel offers an incredible leisure area featuring a swimming pool to relax in, children's playground and full Shishindo spa. Guests can also enjoy free transfers to the airport and free parking. The Pullman São Paulo Guarulhos Airport Hotel has everything you need to host important events such as weddings, social gatherings, birthdays and other important festivities. Ask us about personalized offers for weddings, wedding nights and bridal packages! DAY USE: Stay for a just few hours, perfect for night flights and connections. Pet-friendly hotel! Dogs and cats weighing up to 22 lbs (10 kg) are welcome - fees apply. Comfortable, fully equipped apartments with modern decor, bathroom with shower, cable TV, telephone, air conditioning, alarm clock, minibar, safe and high-speed Internet. The Base Bistrô & Bar offers a new, casual concept for private dinners or meetings between friends. Open for breakfast, lunch and dinner, it offers menus based on contemporary cuisine and is an excellent place to meet for happy hour. The Base Bistrô & Bar is a great meeting point for happy hour in the area and for those looking for musical performances to liven up their night. 수면을 취하기 아주 좋았고 침대가 특히 편안했습니다. 2회 투숙했습니다. 시차적응을 위해 숙면을 취해야 했는데 침대가 아주 좋았습니다. 다만, 10.10일 9층 투숙할 때는 객실문이 문이 잘 열리고 닫히지 않아 불편했습니다. 2번째 숙박이였고, Brand Name Value에 기대하고 갔으나, 몇가지 부족한 부분이 있었습니다. 1. 냉난방장치 고장: 난방모드는 있으나 마나 두번 모두 안되서 냉방만 됐으며, 결국 별도의 히터를 가져왔습니다. 2. 식당메뉴도 별로없고, 나온 스테이크도 냄새가 나고 기름덩어리였으며, 맥주 종류도 local맥주 하나만 있었습니다. 전반적으로 제가 좋은 호텔에 비싼 돈주고 있다는 느낌이 전혀 안들었습니다. 다시는 가지 않을 생각입니다. 다른 값싸고 서비스 좋은 호텔이 많은데 공항가까운 것 빼고는 이점이 없는 듯 합니다. 공사 때문인지 어수선한 분위기가 전에와는 다른 느낌이였다. 조식을 위한 레스토랑도 분위기와 음식 모두 전과는 매우 달랐다. 비행편 연결을 위한 1박이였지만 매우 편안한 휴식을 취하고 다시 여정을 계속할 수 있었습니다. 아침식사도 매우 만족스러웠으며 친절한 셔틀버스의 기사님도 인상적이였습니다.